The Gulf of Mexico is home to some of the world's most beautiful pristine white-sand beaches, offering more than 1,680 miles of coastline along its United States shoreline area. Many top-ranked beaches and resort towns are easily accessible as day trips from Tallahassee, providing urban dwellers with opportunities to swim, boat, and enjoy water sports on along the Gulf's unparalleled turquoise waters. Bald Point State Park is the closest beach to downtown Tallahassee, located at Alligator Point on the Ochlockonee River near U.S. Highway 98. The state park is a popular wildlife watching area, home to a wide variety of wading and shorebird species, including bald eagles and other migrating raptor species. Two public-access swimming beaches are offered along Apalachee Bay, which are popular spots for kayaking, canoeing, and windsurfing throughout the summer months. The park is also a top spot for fishing in the Tallahassee area, offering a fishing dock and area for shoreline fishing. Nature trails meander through the park's 4,065 picturesque acres of natural habitat, with picnic areas available for relaxing and observing the scenery. 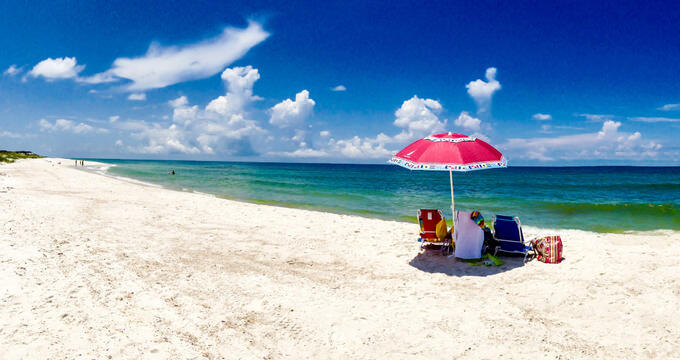 Cape San Blas is one of the best day-trip vacation spots near Tallahassee, located along the St. Joseph Peninsula approximately 10 miles from the town of Port St. Joe. The cape, which was formerly used as a Confederate Saltworks facility during the American Civil War, is home to Dr. Beach's best beach of 2002, located within the beautiful T.H. Stone Memorial St. Joseph Peninsula State Park. Miles of pristine white sands attract swimmers, snorkelers, and sunbathers throughout the year, with expansive stretches of high sand dunes and pine scrub for kayakers and canoers to observe from the water. Fishing, hiking, cycling, and birdwatching are also common activities at the park, which is home to more than 240 native and migratory bird species. Historic attractions include the Cape San Blas Lighthouse, constructed in 1883. Pet-friendly vacation rentals are available for overnight stay, and a number of family-operated restaurants serve up some of the area's best fresh seafood dishes. Grayton Beach State Park is a lovely Florida state park spanning 2,200 acres, located near the unincorporated community of Grayton Beach, approximately two and a half hours from Tallahassee's city center. 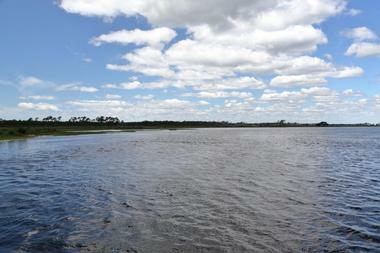 The park, which was opened to the public in 1968, is one of the state's most popular park facilities, preserving the state's second-largest coastal dune lake, Western Lake. Some of the United States' most pristine beachfront areas offer crystal-white sands, clear turquoise waters, and excellent opportunities for swimming, snorkeling, and fishing. Kayaking, canoeing, and boating are popular throughout the warmer months, offering unparalleled views of salt marsh and sea oat dune habitats on the shore. Visitors can also enjoy hiking and wildlife watching opportunities in the park's interior, with overnight cabin rentals available at the park's second unit, located one mile west of the main unit. Panama City Beach is a charming beachfront town in Bay County, located approximately two and a half hours east of Tallahassee on the gorgeous Gulf of Mexico waterfront. The popular resort area claims to be home to the "World's Most Beautiful Beaches," offering more than 27 miles of stunning white sand beaches throughout its greater urban area. Calm, clear waters make for excellent swimming conditions, with opportunities offered throughout the year for water sports such as parasailing, boating, and diving. Canoeing, fishing, and biking are popular at the protected nature reserve St. Andrews State Park, while ecotourism opportunities abound at the 185-acre Camp Helen State Park. Within the town center, tourists can dine at nightlife institutions such as Schooner's Last Local Beach Club or shop at the eclectic Pier Park open-air retail complex, which is home to attractions such as an IMAX theater and an XD Darkride Experience. St. George Island offers more than 28 miles of pristine beachfront, located approximately an hour and 45 minutes from Tallahassee via the Big Bend Scenic Byway Coastal Trail and the five-mile Bryant Patton Bridge. The island's public beachfront is consistently ranked as one of the United States' best beaches, offering unparalleled views of Apalachicola Bay and excellent conditions for swimming, fishing, sunbathing, and shelling. All of the island's beaches are pet-friendly, with the exception of the nine-mile beach at Julian G. Bruce St. George Island State Park, which is home to a dog-friendly boardwalk. Some of the Forgotten Coast's top fishing areas are offered at the East End Fishing Beach, accessible via permit only. Other popular beachfront areas include the island's Unit Four Beach, home to lovely freshwater tide pools and excellent opportunities to spot shorebirds such as diving kingfishers. St. Marks National Wildlife Refuge is one of the United States' oldest wildlife refuges, originally established in 1931 as a protected wintering ground habitat for migratory bird species. It spans more than 68,000 acres throughout Taylor, Jefferson, and Wakulla Counties, home to lovely saltwater marsh, tidal creek, and estuary habitats along seven of the state's northern river systems. Over 43 miles of beautiful Gulf of Mexico beachfront are offered throughout the refuge, with access ramps for kayakers and boaters and designated areas for freshwater and saltwater fishing. Miles of hiking and biking trails span the refuge, including a trail along a former railroad corridor that connects to the nearby town of St. Marks. Visitors can observe a wide range of native and migratory bird species or trek to the St. Marks Lighthouse, Florida's second-oldest historic lighthouse. The park's visitor center is also home to a bookstore, education building, and activities organized by the refuge's active photography club.